What is Sauna Dome & Biomat Technology? 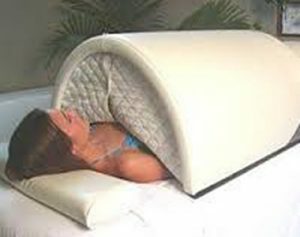 A “Sauna Dome” is a pod-like device that encapsulates the body and delivers a special type of deep penetrating heat which is often referred to as an infrared sauna. A “Biomat” is a mat one lays on that delivers healing properties that also penetrate deeply into the body to detoxify and revitalize your cells. Our sauna therapy offers the best in detoxification of your body and can help cleanse you of toxins and increase your immune system. We’re not like any normal sweat lodge, a Sauna Dome/Biomat half hour session is like no other therapy offered in Northeast Ohio! Burns up to 1000 calories in one half hour. Clinically proven to reduce stress. Regenerates damaged cells of the body by increasing circulation. It will help detoxify 20% more toxins versus only 3% in a conventional sauna. Compliments any nutritional or other health improvement program. Call 440.384.3099 to schedule a Consultation or for more information!